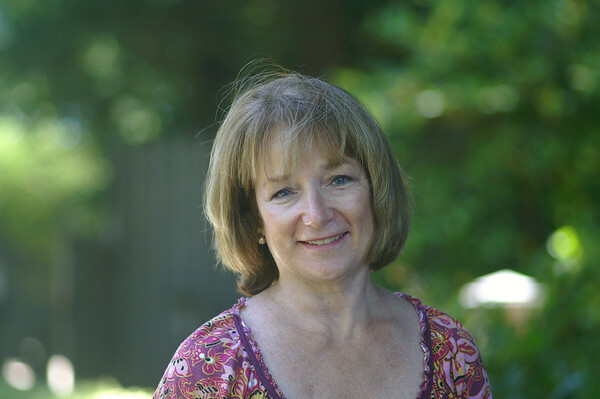 Hi, I'm Karen, author of Karen's Kitchen Stories. This blog is a chronicle of recipes I have successfully attempted (and sometimes unsuccessfully). I love trying "stretch" recipes that are a bit of a challenge. My recipes aren't necessarily simple. In fact, some of them might seem a little bit complicated. They may even have lots of ingredients. I am into exploring cooking, and am really into learning new techniques. My posts and recipes are meant to teach you (as I teach myself) that you can make some pretty fabulous food. Trust me, if I can do it, you can too. I also am a total bread geek. I have immersed myself into learning how to bake bread, including sourdoughs, and someday would love to take a serious bread baking course. In the meantime, if you don't understand some of the terms I am using, feel free to shoot me an email or comment on one of my posts, and I'll try to help. I've never been a baker. In fact, cooking has never been an interest until recently. My family members were never into cooking either. The only time I ever made a big effort was when company was coming. However, about ten years ago, I discovered the King Arthur Flour website, and ordered their sourdough starter. Believe it or not, after never having baked bread before in my life, I decide to start with sourdough. Thank goodness it worked out! My favorite kind of bread.. I prefer lean bread with a levain, but I also love laminated breads, such as croissants. Oh, and I love, love, love pizza. I can't live without a kitchen scale. I also love my instant read thermometer, pizza stone, and dough rising buckets. I also love baking loaves in a Dutch oven. 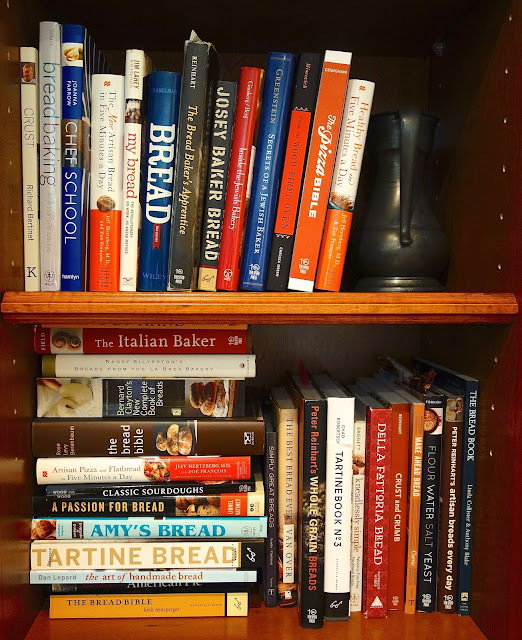 My bread book habit is a little out of control. Baguettes. Getting those big holes in the crumb while not pancaking the dough is always a challenge for me. Slightly adapted from = I made very few changes. Adapted from = I made some changes, sometimes with the ingredient list, and sometimes with the technique. I also may have converted volume measurements to weight. Inspired by = I have made a lot of changes but I still want to give credit to the original author for the inspiration. If you are a blogger and are inspired to make one of the recipes from this blog, be sure to use your own photos and your own words and link back to my post. I'd be honored if one of my posts inspired you! I take all of the photos on this blog. I still need to learn a lot more about my camera as well as post processing. It's on my long list of things to do. If you'd like to use one of my photos, please ask for my permission. I usually say "yes" as long as you post the photo only and provide a link back to my blog and you do not post the recipe. I love it and am thrilled when you "pin" my photos to Pinterest as long as you do not remove the link back to my blog and you do not copy and paste the recipe into the comments section. I'm on Facebook, Pinterest, and Instagram. I'd love it if you would follow me for updates. Hi Karen! I've already been inspired by a few of your recipes. I can't wait to get into the kitchen and try a few. Thanks Tina! Can't wait to see them! Thanks Tracy! Your blog is so gorgeous! Oh you should see the disaster before, during, and after a stir fry! Thanks so much Mike! You just made my day! Isn't it an amazing hobby? I am smiling from ear to ear. I'm glad too! You've made my day Pie! I love everything about this !! amazing recipes and fabulous pictures. Very nice to meet you! Lovely blog! Thank you so much Lyn! Nice to meet you too! But now, please can you help me: I know how to cook but NOT to BAKE. My husband, who is Indian, l o v e s freshly baked (german!) bread, which of course is not possible to get here. In fact the bread is pretty ......:):), far too sweet. Only 2 type of flour available (Atta and Maida). So his wish for 2016 is for me to bake him some bread at home - but looking at your list I do not know which bread to choose to start with. So, please suggest a plain easy to bake bread to make a happy husband and subsequently a happy (german) wife :). Thank you so much in advance. Since you don't have access to rye, I would suggest any of the tangzhong breads, as well as the basic sandwich loaf. They are easy! Your blog is so cute :). Reading your blog has made me hungry. I'd love to share with you some ideas. How can I contact you? I have always loved bread baking although I never really did too much about it, that is until I met you Karen and discovered your blog. You my dear bring out the bread baking in everyone. Thanks. You just made my day, week, month! It's been great getting to know you on FB Karen. I am a dabbler in yeast breads off and on. Knowing you has inspired me to really get into making bread more of a 'thing' in my kitchen repertoire once again. Everytime I see one of your breads I can't wait to get started! Thanks so much for your wonderful photos and inspiration! Thanks so much Karen!!! Yes, I finally got around to posting it. You guys were my first tasters! Saw your post in Foodblogger Central and thought I check-out your website and now I bookmarked you. 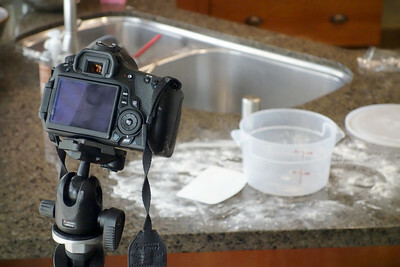 Your recipes look very appealing as well as your pictures. Need to learn to bake bread, will need to start trying more often. Will be a regular guest. Thanks so much Marinka! You totally made my day! Also agree on your comment that "I can't live without a kitchen scale" Mine never leaves my bench, and use it several times every day. Start my day by weighing the coffee I put in my espresso machine (and the milk I put in my coffee) If nothing else, saves washing up - no need to dirty various sized spoons and cups etc. Which brings me to a huge request I have. Could you please, pretty please, give weights, not just spoons and cups in your recipes? Yes, I am aware that some people don't have kitchen scales (although I don't understand why) and prefer cup measurements, but could you PLEASE give both? Just looking at (and planning to make) your pull-apart garlic rolls, but what, pray, is 1 teaspoon plus 3/4 cup water? :-) Wouldn't it be simpler to say 6.17oz or 182ml (or thereabouts... I am sure that 6 oz or 180ml would still be more accurate than 1 teaspoon plus 3/4 cup. And of course, there is the 6 tablespoons of butter. What is wrong with 3 oz or 85gr? Thanks for your feedback. I do the best I can on providing weights because I use a scale too. Regarding the 1 tsp and 3/4 cups, the teaspoon was for sautéing the garlic, and the 3/4 cup (6 ounces) is for the dough. I very much enjoy your blog and have made a number of your recipes/ formulas. All were excellent. Thanks very much. I have not tried it yet. I may have to now! I've loved all of their breads I've tried except the durum bread, which for me fell flat as a pancake! Well, I tried the durum/semolina loaf today and it is as flat as a pancake. I'm so glad it wasn't just me although it would have been nice to know if someone found the "secret sauce." I'm thinking of emailing them for some hints. I emailed them about the Meyer lemon/rosemary but got no response. Much better luck on the second try at the durum/semolina. 15 minutes in the KA at speed 2 plus 4 stretch and folds at 30 minute intervals. I continue to be amazed at the depth, diversity and frequency of your blog posts. And everything I've tried has been really good. Just out of curiosity, what does your day or week look like? You have the best food blog I've found. Keep up the good work! Awww. Thanks Dave. I have a day job so I cook and take pictures on the weekend and then do the write ups at night.